Jesus had taught us a few times the importance of readiness. He used the Parable of the Ten Virgins and asked us to learn from the wise virgins who brought oil with their lamps. (Matthew 25:1-13) He also asked us to be like a master who stays awake to not let his house be broken into. 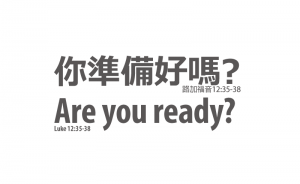 (Matthew 24:42-44) He used different analogies to preach the same message: no matter when He comes, we have to be ready. Jesus said: “But of that day and hour no one knows, neither the angels of heaven, nor the Son, but the Father alone.” (Matthew 24:36) Instead of speculating when that day will be, we should live constantly in the present to seek and find God there. When Christ comes again, we will be able to welcome Him with joy.